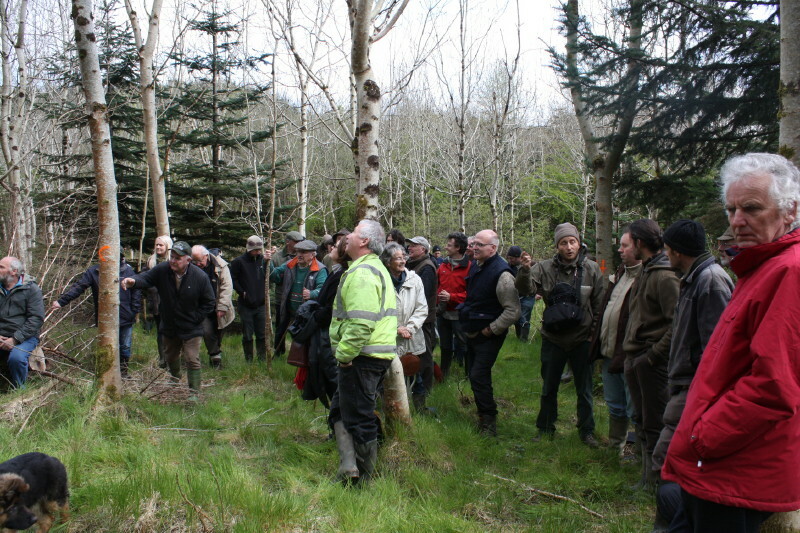 OVER 70 people journeyed to Keshcarrigan, Co. Leitrim on April 28 for the first of Prosilva Ireland’s 2012 Open Forest Days. 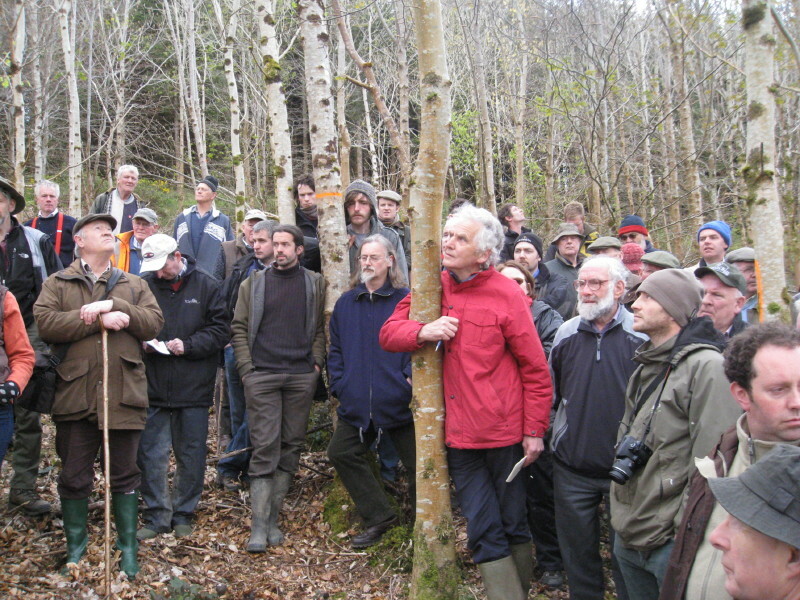 Learning in the live wood: Prosilva’s Open Forest Day passed on practical management techniques for plantations converting to close-to-nature continous cover forestry in Ireland. Guest speakers Marc Etienne from ProSilva France and the ProSilva Czech Republic’s Thomas Vrska shed light on principles of continuous cover forestry in Mary and David Legge’s forestry plantations on Saturday April 28. 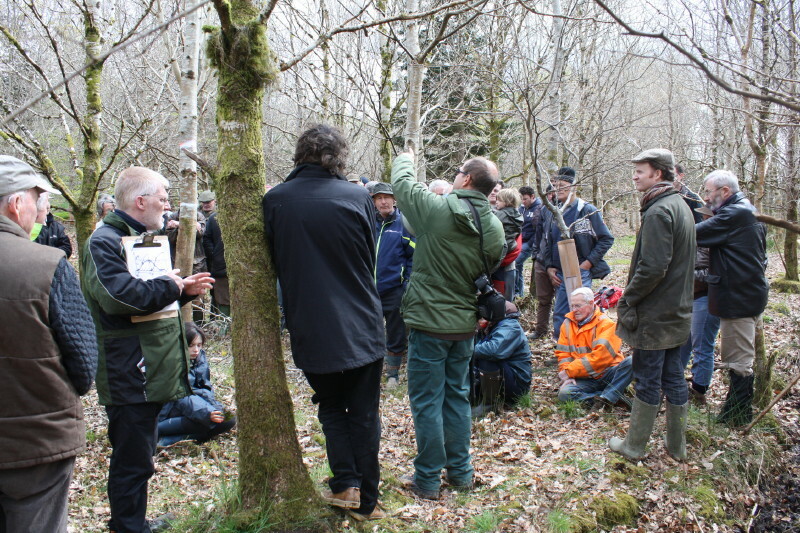 Marc, a lecturer in silviculture, described how the forest builds itself and said continuous cover was about using that natural process to produce quality stems whilst preserving the non-economic assets of woodland. He said humans were conditioned from an early age to equate building with working. In the case of modern forestry this had resulted in a cycle of clear felling and re-planting to build again. The Legge family have a range of forestry plantations, all of which are being transformed to continuous cover forestry. 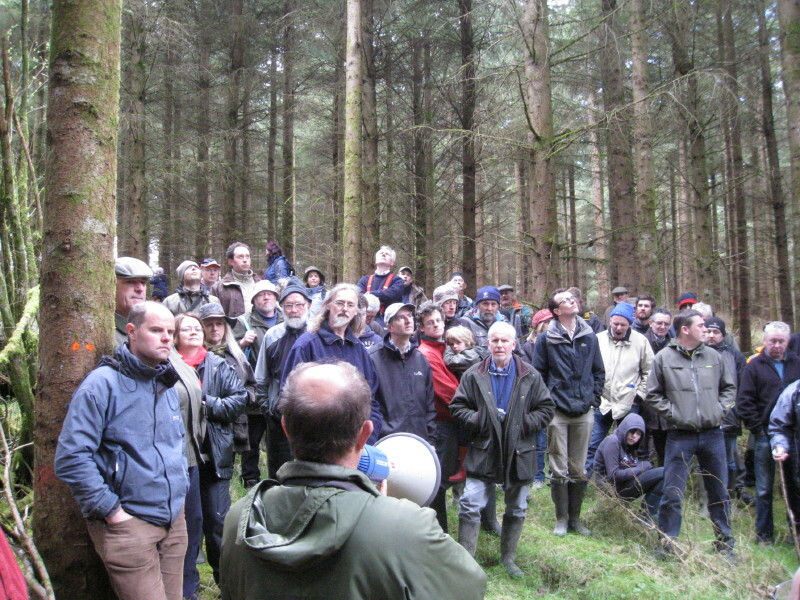 Some of the 70 attendees in a broad leaf stand at David and Mary Legges’ Leitrim property. THE first stop of the day was a small mixed hardwood stand which consulting forester Paddy Purser said had been planted 23 years ago. Hare damage had been an issue during establishment. Tomas chopped a sample of soil from the forest floor and explained the positive influence of the broadleaves on its structure and quality. Tomas, also a forestry lecturer and current chair of ProSilva Czech Republic, said the site had previously been pasture and had suffered from compaction during that time. But an inch of new hummus could clearly be seen at the top of the sample. He said the soil had good structure and oxygenation which was in contrast to the Legge’s sitka spruce stand where mechanical harvesters has caused compaction. The advantage of the broad leaves were in their ability to improve the soil. “It’s a very good way to reconstruct soil production potential and one of the key ProSilva aims is protecting the soil and therefore its potential production ability,” Tomas said. This was in contrast to coniferous mono-culture systems where the build up of needles on the forest floor could lead to soil degradation. Tomas said an added risk in Ireland due to the high rainfall was that acid from the needles washed quickly into the soil where it would react with minerals, such as calcium and magnesium, which were then caught up by the acid water and drained down away from root zone. Assessing soil quality was one of the first steps in establishing the character of a site and therefore the limitations and challenges for establishing forestry there. Marc pointed out an old, pre-plantation ash tree that was covered in ivy. He said the tree’s height provided an indication of the height the plantation trees would initially be limited too based on the fact they would begin life facing the same soil and site conditions as the old ash had. As the soil improved under a broad leaf canopy the plantation had to be managed for individual trees and at a social level. A variety of stems had been marked in the plantation to demonstrate, either as a Potential Crop Tree (PCT) or as a tree to remove.A straight-stemmed sycamore surrounded by poorly-formed broad leaves needed to be freed from competition to develop. Marc said four of the competitors should be removed which prompted the comment that four would be more than was usual in the Irish experience for a first thinning. Because the tree was big and healthy, Marc said it would be able to handle the removal of four of its neighbours and because the tree was located near the centre of the plantation, the gap would not de-stabilise the whole woodland. Whether a tree was of good or poor quality it could be used to increase the value of the whole stand. Marc characterised trees as big or little brothers of good or bad quality. “Look for the big brothers that are nice and will best respond to your help. You also see among the little brothers bad trees. They have a function as soil cover and stem shade,” he said. While not competing with the main crop trees, the small, poor trees dropped leaves to increase soil fertility while also preventing main crop trees from shooting any side growth that would reduce their timber quality and create a need for pruning. Among the sample plot were high stumps of freshly felled beech, cut off around chest height. 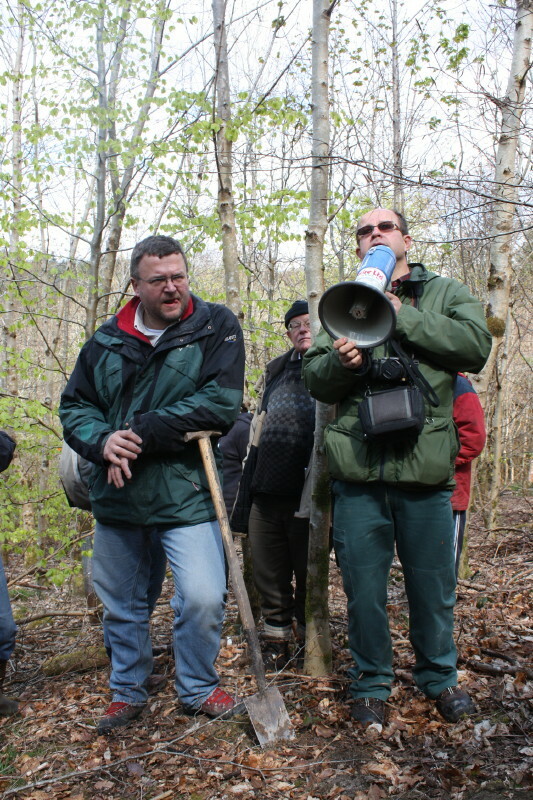 Marc explained the beech stumps had been left high for a number of reasons; that beech was shade tolerant and would coppice, so the stumps would shoot again and thrive beneath the canopy where they would provide leaf litter and would stop side growth from PCTs. They had been cut high so hare and other game would be unable to graze the re-growth. The coppiced stumps would also preserve live beech in the woodland for future seed stock. That example of the beech showed how individual trees aided the overall plantation as it moved through the various stages of establishment to maturity. At first the owners establish the plantation and are busy insuring the survival of seedlings against the threats of grass, shrubs and browsing animals. “When you finish establishment it is then to the qualification stage. Quality comes from competitive pressure and at this stage every tree helps to make the nice trees and even the bad tree is useful,” Marc said. He gave the example of the bad tree’s branches rubbing against the good tree’s trunk, therefore preventing side growth and reducing the need for pruning. He said it was important to keep the plantation dense during the qualification stage and the duration of qualification depended on the species; ranging from 12 to 15 years in birch and 20 to 25 in oak. “The next stage when qualification is finished, is the start of expansion.” This was when the trees began to reduce their annual height increment and start to put on more width at which time the owners needed to intervene to take out competitors that touch, rub or shade the crowns of the quality trees, Marc said. In removing competitors it was important to help the individual trees at their strong points first. Marc pointed out a strong side branch in the crown of a sycamore and how the tree nearest to this had been removed. “That’s the strongest part of the tree and it has to eat where its mouth is and its mouth is the branch. If you help the tree where there is no branch its like trying to feed a cow on the wrong side. Start to help on strong side,” Marc said. He said what followed was the maturation stage where the crown, which was like a motor created in the earlier stages, would power the tree’s width increments. 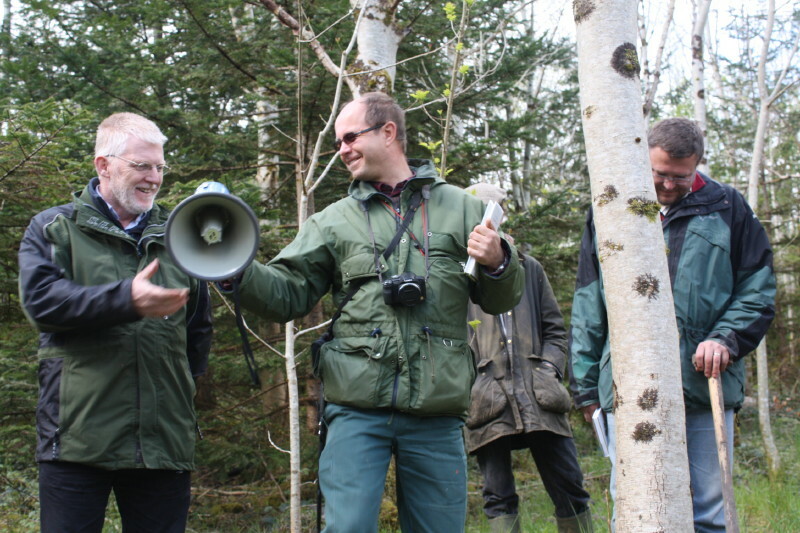 Forester Paddy Purser, ProSilva Ireland looks on as French silviculturist Marc Etienne discusses options for the Legge’s High Yield Class sitka spruce plantation. THE next stand was of High Yield Class Sitka spruce planted in 1990 which had received two transformation thinnings using the Graduated Density system.The 10 hectare block had been thinned in 2006 and 2009 and its PCTs had been pruned in 2007. Marc said the conifers would have to be managed differently to the broadleaf stand. The triangular profile of the conifers meant there was less need to free PCTs from their immediate competitors and as long as the overall density of the stand was managed enough light would filter through between the pyramids of the individual trees’ foliage for sustained growth. 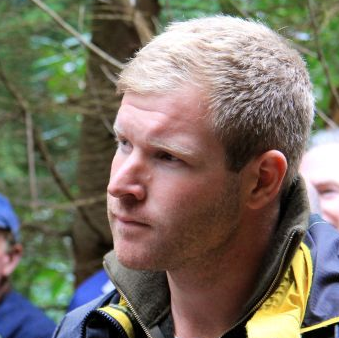 So the goal of thinning in a conifer plantation that was converting to continuous cover forestry was to prolong the life of the stand overall to give it time to self-regenerate whilst maximising the volume of timber to sell and at the same time not reducing the overall basal area too greatly, Marc said. The basal area was the area of the plot covered by the area of the combined tree trunks. Paddy Purser said this strategy fitted nicely with the current market demands in Ireland. There would be less cost involved in marking and harvesting the selected thinnings because less trees of a bigger size were targeted. In addition the current demand for saw logs meant it was also of more value to the owners to take the big than the small. “At the moment it is easier to sell trees of a certain size and the smaller ones can grow for next time, so we manage the trees for the market,” he said. The Legges’ High Yield Class sitka spruce would be thinned under a continuous cover regime that prolonged the life of the orginal plantation stock, allowing natural regeneration to occur while profit was generated through the thinning and sale of the biggest, baddest trees. Tomas then took another soil sample and showed how the quality was not as good as that of the broadleaves despite being from the same hillside. He directed the group to a windblown sitka at the edge of one of the mechanical harvester’s thinning racks were he showed how while one side of the tree’s exposed root system had been healthy when it had fallen, the other side, which had suffered from soil compaction when the harvester had passed over it, was dead. This had resulted in the de-stabilisation of the root plate and the tree blowing over. Tomas said cable harvesting systems were used in the Czech Republic to avoid such damage. In his country there was not as much of an issue with wet soil as in the Irish situation. Questions were raised about the wind thrown areas in the plantation and Paddy Purser said the wind was finding the weak spots in the stand and picking them out. The resulting clear spaces would be used to advance regeneration with broadleaf species that would improve the soil fertility, he said. THE third site of the day was of poor quality broadleaves but the trees that were there could be used to create a more valuable forest in the future, said Marc. The few good trees could be aided with the removal of their competitors and where there was only gravel the big, bad trees could be felled and used for firewood and income. “Where there is gold create little gaps around it and where gravel, take the biggest ones,” Marc said. The resulting patches of light and shade would aid natural regeneration of seedlings. Marc said the different light zones would provide havens for the seedlings of different species. “Create a contrast of full light and full shadow and in between shades.From this chaos something will come and you adapt yourself to what comes,” he said. 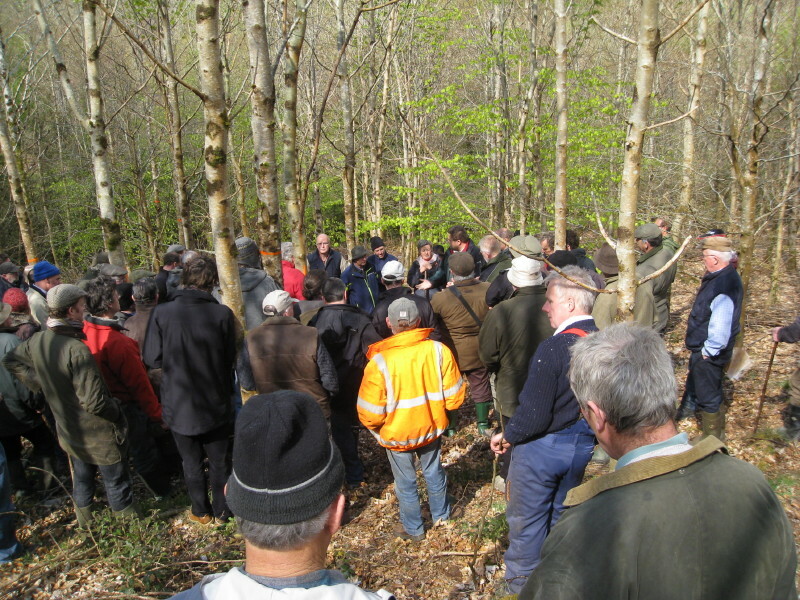 TOMAS continued on the theme of regeneration at the fourth site, a stand of 23-year old noble fir and ash, which provided a final example where canny management of the self-building forest could generate profit. Paddy Purser explained the thinking at the time of planting had been that the noble fir would help the ash establish and could then be cut out and sold for Christmas trees. Tomas said the quality of some of the ash was poor and that while the site stood on good soil there would be a problem with natural regeneration because of the well-established grass. However, he said discussions between himself, Marc and their Irish hosts, had resulted in a solution that combined the experience from the different countries represented and used the characteristics of the site to best advantage. Hurley butts and firewood will turn a mid-term profit while some of this mixed plantation’s noble fir will be sacrificed to provide sheltering seed beds for natural regeneration. In Ireland the hurley market meant the butts of the big, poorly-formed trees could go for hurls and the rest of the harvestable trunk for firewood. He then pointed out a noble fir that had been left where it had fallen. The grass beneath the tree had died and so provided good conditions for numerous ash seedlings to establish themselves. “The branches had also protected the seedlings against browsing game”, Tomas said. ProSilva Ireland chair Padraig O’Tuama, left, with guest experts Marc Etienne, centre, and Thomas Vrska, far right. At the conclusion of the day PSI Chairman Padraig O’Tuama thanked our special guests, Marc Etienne and Tomas Vrska for so generously sharing their knowledge. He also thanked Mary and David Legge for hosting what had been a most informative and enjoyable day. 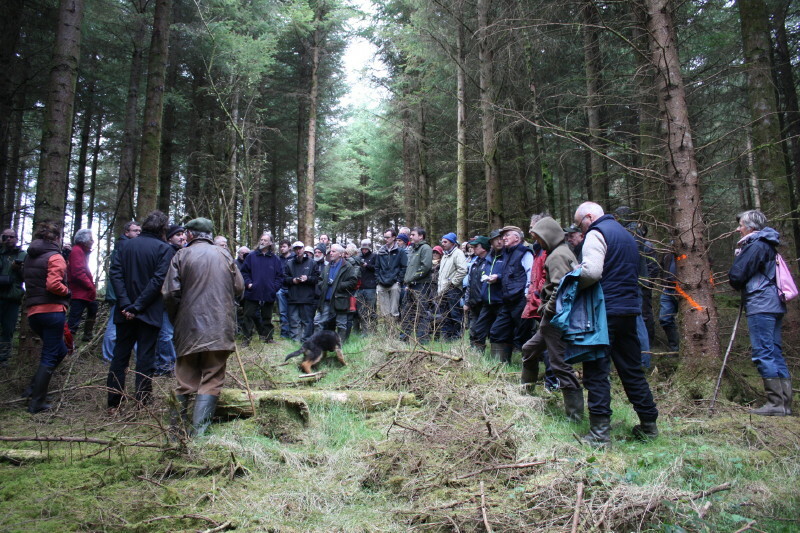 Previous Entry Upcoming April 28th 2012 Open Forest day in South Leitrim – All Welcome! Hi Damion, glad you liked it. Send me an email there at sean.hoskins@yahoo.co.nz. Did you know there’s a Prosilva open forest day on tommorow in Kildare? Details on the news pages of this site. There’ll be guest speakers and plenty of forest owners, timber industry people and people with an interest in forests and conservation there. Hello my dear Irish new friends. I was glad to read this report. I just want to correct a mistake on the first site : I said the qualification stage and the duration of qualification depended on the species ; ranging from 12 to 15 years in birch and 20 to 25 in oak (not 10 to 15). Excellent report, thanks. I was disappointed I couldn’t make the event but the report has some excellent information! Congratulation on a very good report and excellent photos of another incredibly well attended PSI visit. Congratulations PSI for always sharing European experience to stimulate thought and understanding of how forests work and change. There will soon be a day when foresters stand in mixed, irregular high forest all over Ireland; and when they will never be far from a soil pit! Very nice read! I love the quotes! I’ll be using some of those soon I think. I agree with everything Joe Barry said – including the “hard of hearing” bit! Thanks for that Sean – great notes on the day – a really useful record. I haven’t been marking since the day but can’t wait to get my spray can out next week!! What a super report. This is how all Pro Silva outings should be recorded. The text contains important details that some may have missed (especially those hard of hearing like myself!) Without reports like this we can often miss or forget many vital items of information. Well done and thank you. I look forward to more of the same. A nice detailed report, well done Sean. It was a great day and the information and discussions on the day were thought provoking as ever.